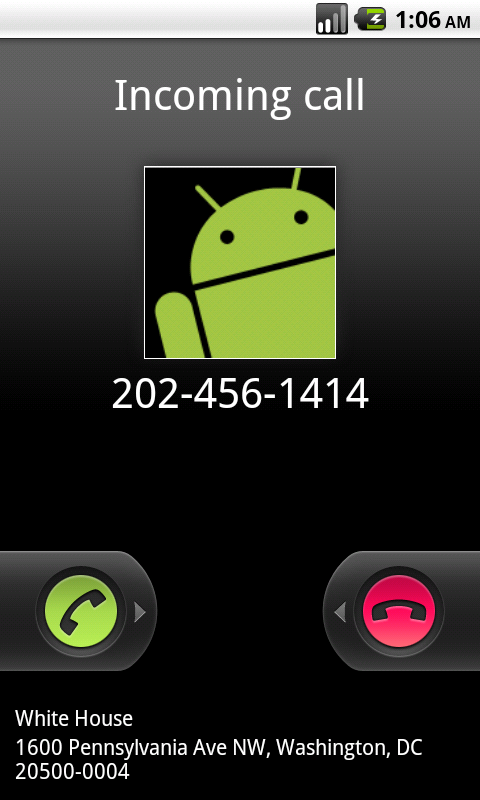 I’ve been looking for an excuse to write an Android app, and those annoying “unknown number” phone calls presented themselves at the perfect problem to solve. My CallerID application consists of two parts: a service that runs on a server and given a phone number returns the information associated with it, and an Android app that uses the service to display information to the user upon request or when the phone rings. The Android application is written in Java, licensed under the GPLv3, and is available on the Google Android Market and (hopefully) soon on the Amazon Market and f-droid. The Android app source code is also available on gitorious. The application requires at least Android 1.5 – and supporting Android 1.5 all the way to 2.3 was an interesting experience, especially in the area of the Contacts API. 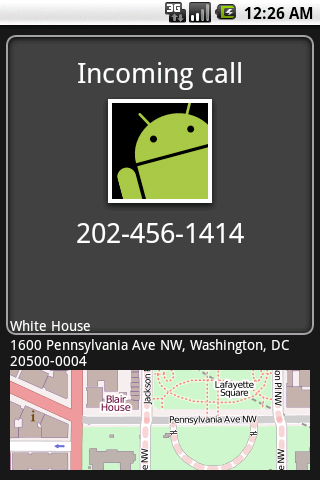 It uses OpenStreetMaps (osmdroid) for maps (instead of Google Maps, as not every device has Google Maps, and Google Maps is not Free Software) and roboguice as an application framework. Maven manages dependencies, so I don’t need to include large binaries in the source repository. Using a Maven multimodule approach, I can have a separate integration testing project (application-it) and application project (application), making automatic testing easy. Maven automatically will run proguard (for optimization, not obfuscation), zipalign, and signing when given a “release” profile, or skip those steps when running under the default profile. I used the maven-android-plugin as a key component of the build process. If you’re starting an Android project, I highly recommend you check it out. These steps do not perform the integration tests. If you want to run those, in the step above that says “cd mainline/application” run “cd mainline” instead. Note that you’ll either have to have your Android phone plugged in to your computer (and running in debug mode, recognized by adb) or an Android emulator running. That’s it – Eclipse should automatically build as you go, and you can use the Eclipse/Android development tools just as everyone else does. I hope both the server portion and application portion are reasonably easy to run, build, and understand. If you have any questions or concerns, please comment – and contributions are of course very welcome to both projects! Please note that this project is not in any way related to my employer – it is a completely personal, non-work project. This article has been cross-posted to Isobar’s blog. 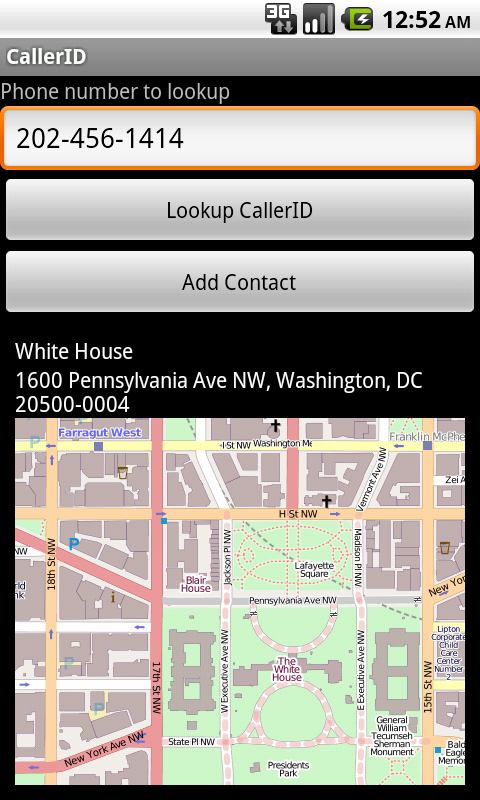 My First Android App: CallerID by Craig Andrews is licensed under a Creative Commons Attribution-ShareAlike 4.0 International License. Is there a database of known spam-callers that we could add? Would be great if those unknown numbers were tagged. Since they may have a name from your regular database query, maybe we could color them in RED or something? There are a number of such databases (some are country specific, some not). I intend to add support for just such a feature, including the ability to simply ignore calls that come from known spammers (assuming the platforms allows such call blocking… we’ll see). First of all, thanks for this wonderful project. You don’t list the Netherlands as supported, but you do have The Netherlands in the drop down menu on the Caller ID web service. However, it doesn’t seem to work on any phone number I know, both local and landline. Are you planning on adding support for The Netherlands any time soon? Unfortunately, for now, all I can do is tell you that the phone number is from the Netherlands. I can’t find any web sites that will perform reverse number lookup for the Netherlands (given a phone number, return who owns it). If can find one, let me know and I’ll gladly add support for it as quickly as I can (probably within a couple of days). but it will not compile. I’m also working on an update that will lookup the incoming call’s location offline (which will work nicely for the non-LTE CDMA users). I plan on displaying this offline information until the online lookup completes so at least you get geographical information. Do you still work on this app? Any news or updates? I do not… however, pull requests are welcome and you can always fork it and create your own app.